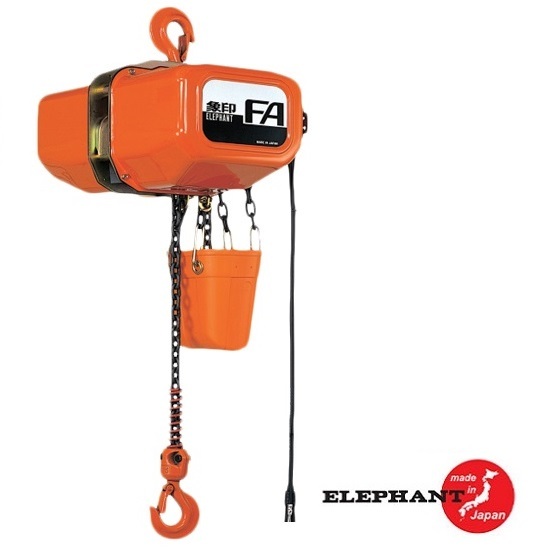 The Elephant Lifting FA/FB Series is a single-speed, three-phase electric chain hoist with a hook mount, a 2.18-horsepower motor with a dual voltage 230V/460V/60Hz power input. It is fully enclosed within a powder-coated steel plate housing. The hoist's motor is insulated to resist heat damage. The plug-in cord on this hoist is designed to connect to the MAS series motorized hoist trolley (sold separately) without requiring electrical work for plug-and-play mobility. Elephant’s unique design for a lower power consumption. Bottom hook with bearing smoothly swivels, 360°. In the event of an overload, the hook gradually elongates. This elongation serves as an indicator to the end user, making them aware of the overload.